Arctic sea ice melts each summer, reaching its minimum extent some time in September, before refreezing through the winter. Over the past 35 years, the September sea ice extent has reduced by about 35% overall and this decline is projected to continue as global temperatures increase. In 2007 and 2012 the summer ice extent was dramatically lower, causing some some speculation that we would soon see a summer which was “ice-free” (meaning a year with less than 1 million square kilometres of sea-ice). However, most climate scientists were more cautious. The weather in 2007 and 2012 was warmer than usual and the winds were particularly favourable for melting sea ice. Although a human influence on Arctic sea ice has been detected, there was no evidence that these weather patterns would continue each year. In contrast, 2013 and 2014 had more sea ice than 2012, causing speculation that a recovery was underway. Is this claim warranted? 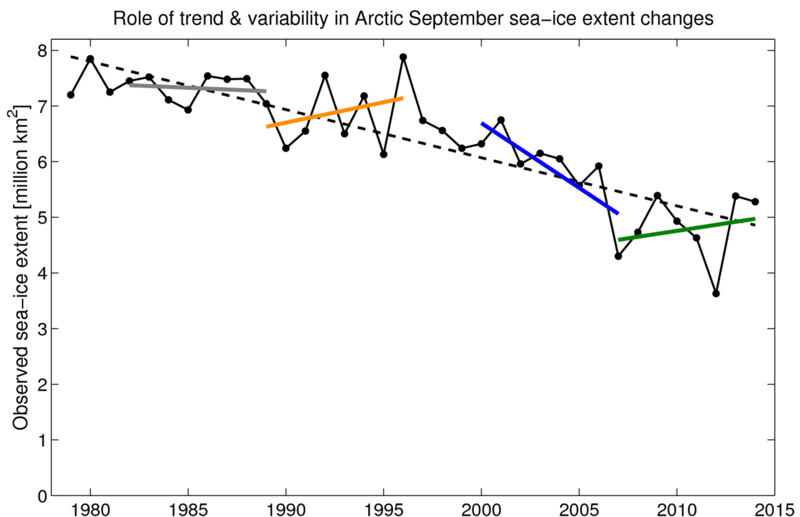 Figure 1 below shows that Arctic sea ice extent (the black line) has undergone a long-term decrease, with the dashed line representing a linear trend. But there have also been shorter periods of rapid melt, no change, and apparent increases in extent during this decline – represented below by coloured trend lines for some deliberately chosen eight year periods. The most recent eight-year period, starting from the extreme low of 2007, shows an upward trend. This does not mean that the Arctic sea ice is recovering – these erratic changes are what we expect to see. As an analogy, imagine a ball bouncing down a bumpy hill. Gravity will ensure that the ball will move downwards. But if the ball hits a bump at a certain angle it might move horizontally or even upwards for a time, before resuming its inevitable downward trajectory. This bouncing ball is an analogy for the changing Arctic sea ice. There is no expectation that sea ice, or any other aspect of the climate, will change smoothly over time. The climate system simply does not work that way. The recent trends are well within the range of expectations from our climate model projections. We might even see a decade or more with little apparent change in sea ice. This entry was posted in Climate, Climate change, Cryosphere, Polar and tagged Arctic sea ice. Bookmark the permalink.